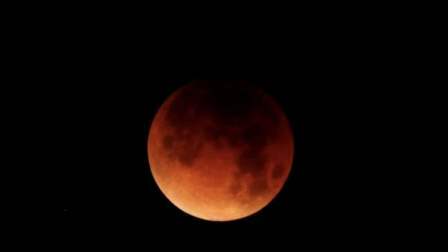 A total lunar eclipse will occur on July 27-28 with a totality duration of 1 hour 43 minutes, the longest in this century, the Ministry of Earth Sciences said yesterday. The partial eclipse of the Moon will begin at 11:54 pm (Indian Standard Time) on July 27. The Moon will be gradually covered by the Earth's shadow and the totality phase will begin at 1 am on July 28. The total eclipse will last up to 2.43 hours. Then the Moon will start to gradually come out of Earth's shadow and partial eclipse will end at 3:49 am IST on July 28. This slower moving full Moon will take longer time and greater distance of Earth's umbral shadow cone to travel. On July 27, the red planet Mars, will also be at opposition, meaning that the Sun and Mars will lie opposite to each other, with the Earth in the middle. This will result in Mars coming close to the Earth, causing it to appear brighter than normal and it will be seen from evening to dawn towards the end of July. The brighter Mars will remain very close to the eclipsed Moon in the sky on July 27-28 and can be spotted very easily with the naked eye. However, the red planet will reach closest to the Earth on July 31. The planet Mars comes at opposition at an average interval of 2 years and 2 months when the planet comes close to the Earth and becomes brighter. Mars opposition that had occurred in August 2003 brought the two planets at the closest distance in approximately 60,000 years. The approach of Mars on July 31 will bring the two planets closest and the planet Mars to be seen brightest since 2003.